And so to Mick Shoulder’s Swing Manouche – more distinct from Djangologie than the name might suggest, not least because only Giles Strong remains in his familiar berth whilst the introduction of clarinet in place of violin makes for a different overall sound. The set list, while still consisting mainly of Reinhardt compositionss (both Django and Lulu) and Mick Shoulder originals inspired by the same, was unexpected, to me, in its inclusion of “standards” such as All of Me, It Had to Be You and Roses of Picardy. Mick explained that these, and many other such “standards” often featured in the repertoire of gypsy bands, adapted to their own style – as Swing Manouche successfully did here. On these three numbers the clarinet featured prominently thus highlighting this new combo’s distinct approach. Midway into the second set came another surprise to me – a tune by Sacha Distel! Inspired by Django he became, apparently, an excellent gypsy jazz guitarist and composed Ma Première Guitare in honour of the first one he ever bought. All this was long before the crooning, velvet jacket era which put him, in my eyes (and Mick’s too, it would seem), right up there with Charles “Aznovoice” in the Pantheon of French vocalists! In their first set we had been in more familiar territory: Coquette was a lively opener while Douce Ambience had a snappy finish and the slower, more romantic Shoulder original, Cigano Bolero had a lovely quiet ending…..after which Mick complained, tongue in cheek, that everyone’s solos were being applauded bar his and that our silence “wounded” him! Cue Django’s J’Attendrai and he got what HE was waiting for – loud applause! Playing bass, he said, was so much easier! Neil Harland, who makes everything look easy, just smilingly concurred. Anyway, maybe Mick had been in need of more obvious encouragement after all? He got plenty for the rest of the evening and was positively flying in the second half! Nuit Solitaire, one of several tunes where the guitarists swapped roles, saw Giles solo-ing on an original described by Mick as “a sad one”: can bowed bass, with which this ended, ever be other than sad? Next up was a new Shoulder original, composed extempore (almost) and in mortal terror of Giles Strong’s large Alsatian, Gonzo, with which Mick found himself alone. Music, especially waltz tempo, seemed to soothe the “beast”, so Mick played on. Thus Valse á Gonzo was born. 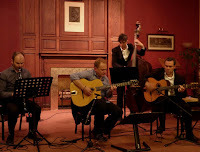 Lulu’s Swing took us into the interval….And Minor Swing took us out of it emphasising that, for all the differences with Djangologie, both bands are all about swing. Which theme continued with another new-to-me original, 51 Swing, some parts of which put me in mind of My Heart Belongs to Daddy. 26 Rue Norvins, in Montmartre, where there was a regular artistic “salon” from the 1930’s onwards, gave its name, R Vingt-Six, to another Django number – a fast one with lots more clarinet. Lulu Reinhardt’s Noto Swing was supposed to be the final number but the audience demanded an encore and got the traditional gypsy jazz closer, Dark Eyes, to send them home happy. Great stuff! 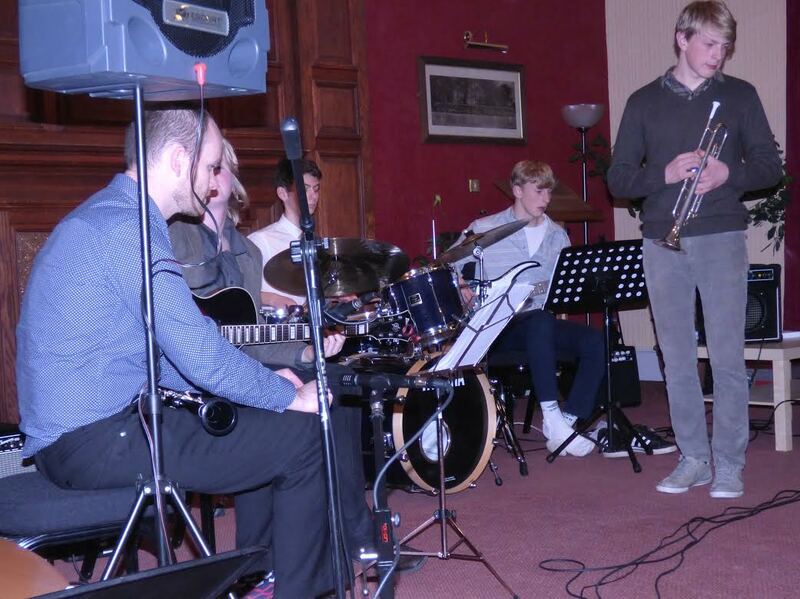 If you missed it, catch them next Friday at the Jazz Café. Earlier, the Early Bird Band kicked off proceedings with last Friday’s line-up augmented by Ben Lawrence on trumpet. Art Blakey’s bluesy, Moanin’, was their opener, featuring the first of several well-received solos by him. Their 4 numbers were by fine composers such as Blakey, Jerome Kern, Sonny Rollins and Francis Tulip! OK, admittedly this last still has a reputation to make but on the basis of his solos tonight and the quality of his Blues for Big Steve (for his Dad’s birthday!) he may do just that! On this original, Matthew McKellar (using sticks tonight, except on Jerome Kern’s Yesterdays) got to solo as did Dan Lawrence, largely invisible behind his brother and some large speakers! Invisible but always much in evidence, especially on Rollins’ St. Thomas (appropriate in a former seminary), where, after a drum intro he and McKellar drove things along in fine style. Another great learning experience for these talented lads – and great fun for the audience again, too. A really great night. I can also recommend Ushaw as a venue - roomier than most jazz places plus free parking as well as an interesting building. There are pot holes on the drive though so take care.